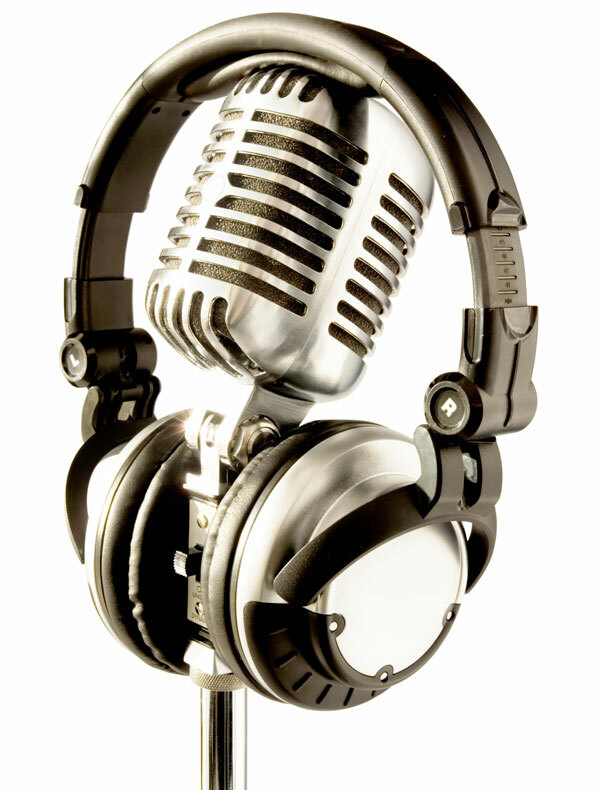 The Arizona Department of Transportation used a mock radio show to announce its new Local Public Agency Stakeholder Council at the Arizona Rural Transportation Summit earlier this year. Jodi Rooney, process manager in the agency’s Local Public Agency section, served as the “host,” interviewing local, county and federal agency “guests” and taking “caller” questions from audience members recruited in advance. The Arizona Local Public Agency Stakeholder Council held its initial gathering a month earlier, in December 2013. The agency chose the council as one of the strategies to pursue under the Every Day Counts effort on locally administered Federal-Aid projects. The Arizona DOT used a mock radio show to draw attention to its new Local Public Agency Stakeholder Council. Before launching the local stakeholder council, a team of Arizona DOT and Federal Highway Administration staff met with their Nebraska counterparts by videoconference to learn how that state’s local stakeholder council works. The team also surveyed local agencies to identify topics of interest. The Arizona council includes 26 representatives from local agencies, government councils, metropolitan planning organizations, the Arizona DOT and FHWA. Its quarterly meetings will provide a venue for local agencies to discuss questions, concerns and ideas on implementing Federal-Aid projects in their jurisdictions. At its first meeting, the council pinpointed topics to focus on in five categories—finance, environment, right-of-way, administration and other. But its overall purpose, Rooney said, is to enhance communication among the organizations involved. Is this initiative right for our state? Is this the appropriate instrument to achieve that objective? Does the value gained outweigh the labor involved to make it successful? Or are the resources required better spent elsewhere? “Involve your partners in planning the council so there is ownership,” Rooney added. Organizing the local stakeholder council is just one aspect of the Arizona DOT’s local agency assistance effort. The agency overhauled its Local Public Agency Projects Manual and developed training to help local agencies and their consultant partners understand the Federal-Aid process. The Arizona DOT has two programs that enable local agencies to administer parts of Federal-Aid projects. One is a certification acceptance program through which it delegates authority to administer Federal-Aid projects with limitations. So far, eight local agencies have been certified. Since the mock radio show at the Arizona Rural Transportation Summit, Arizona DOT staff have continued to spread the word about the new stakeholder council at venues for local professionals involved in transportation. Feedback has been positive. “Here in Arizona, people see value in the opportunity to bring their voice to the table and to work with and through their council members on solutions that might assist with the delivery of these projects,” Rooney said. 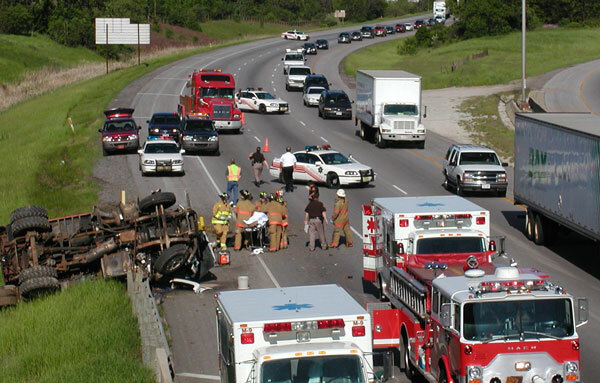 Traffic incident management has been a Wisconsin Department of Transportation priority for nearly 20 years, one that first responder organizations statewide now share. In fact, Wisconsin was the first state to launch a formal traffic incident management program. Regional TIME meeting participants review incidents and share ideas. The Wisconsin DOT started its Traffic Incident Management Enhancement, or TIME, program in Milwaukee in 1995. Through TIME, more than 2,500 first responders and 1,000 trainers have been trained in incident management techniques since 2008. The Federal Highway Administration is encouraging states through its Every Day Counts initiative to implement traffic incident management responder training, also a Strategic Highway Research Program 2 priority. “Quicker clearance of incidents helps mitigate excessive, costly delays and minimizes the potential for secondary crashes through better incident scene management and traffic control setup to alleviate driver confusion,” said Anne Reshadi, system operations and electrical engineering section chief at the Wisconsin DOT Bureau of Traffic Operations. 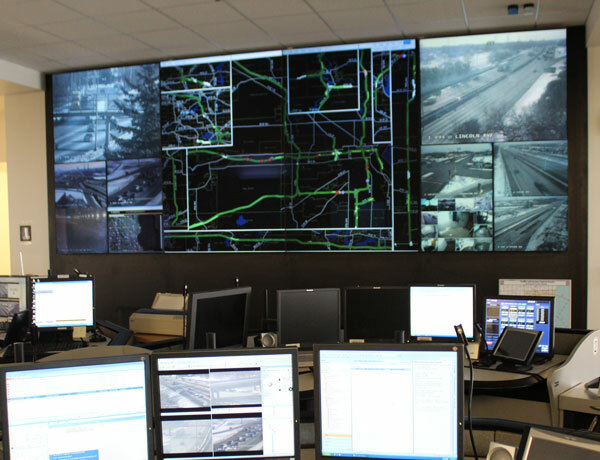 Wisconsin’s Statewide Traffic Operations Center in Milwaukee features a video wall with a congestion map. The traffic management center the Wisconsin DOT opened in 1995 introduced intelligent transportation systems capability. In conjunction with the center’s opening, the agency initiated a study that pinpointed the need for a comprehensive traffic incident management program for multidisciplinary stakeholders, from police officers and firefighters to county governments. In the early days, control room operators at the traffic operations center recorded incident scenes via video recorders as they noticed them. Lessons learned from the tapes were used to debrief first responders at Milwaukee-based TIME meetings. First responders work to clear an incident on a Wisconsin interstate. In 2006, the Wisconsin DOT expanded the TIME program statewide and held its first Traffic Incident Management Conference, now an annual event. 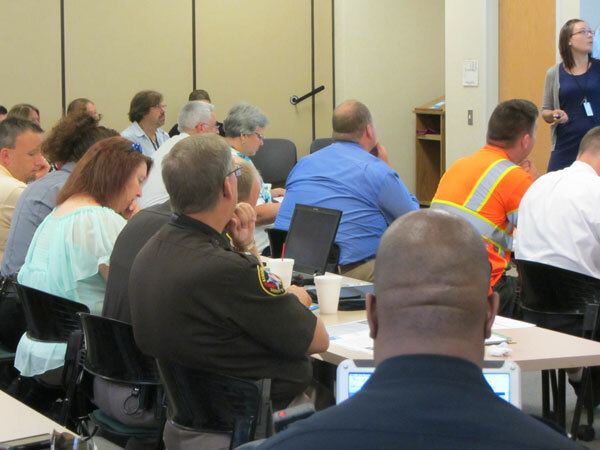 A Wisconsin DOT working group created Emergency Traffic Control and Scene Management Guidelines and a presentation to use as a training tool for first responders. About that time, the traffic management center became a 24/7 operation with the ability to record video more consistently. The videos yielded examples of incidents and responses to integrate into the training presentation. Today, the Wisconsin DOT provides first responders with training materials to instruct their agency personnel in traffic control, scene setup and responder safety. The state’s guidelines for train-the-trainer classes meet the SHRP 2 national traffic incident management responder guidelines. Wisconsin now has 30 regional TIME meetings a year, typically hosted by the Wisconsin State Patrol and a Wisconsin DOT regional operations manager. Attendees are first responders from fire and police agencies, emergency medical services, towing and recovery operations and county highway departments. They review incident responses, both what went well and what to improve, discuss construction projects and share ideas. In 2011, the Wisconsin DOT set a goal to reduce significant incident clearance times by 5 percent a year. Thanks to the TIME program, that goal was exceeded twofold in 2012. Wisconsin’s keys to success include having trainers who can train other first responders in the same discipline and top management support for the program. The state also has many champions who believe strongly in the value of a cooperative approach to traffic incident management and training, said Reshadi. “Fire, law enforcement and towing professionals have acted as champions. With statewide expansion, the program gained unprecedented momentum and a growing community of champions,” she said. 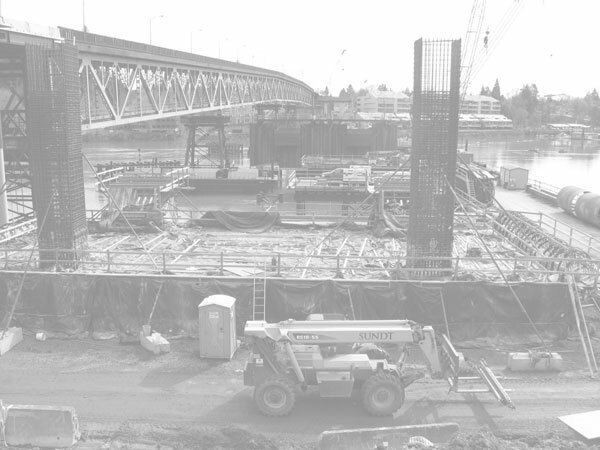 Time and money savings abound on the Sellwood Bridge replacement project in Portland, Oregon, thanks in large part to two Every Day Counts innovations—the construction manager/general contractor delivery method and accelerated bridge construction techniques. Crews install arch rib anchor bolts. Owned by Multnomah County, the Sellwood Bridge crosses the Willamette River and connects a state highway on the west side with a city street on the east side. In the CM/GC process, the project owner hires a contractor to provide input during the design phase, well before construction starts. The county issued a request for CM/GC proposals and signed a CM/GC contract with Slayden-Sundt Joint Venture in 2011. Originally the county planned to build the new $307.5 million bridge in halves, using the existing bridge for traffic while half of the new structure was built. Once the new part was complete, traffic would shift to that side, while the existing bridge was demolished and the second half was built. Foundation work is under way for the new bridge. But the CM/GC proposed using the existing bridge as a detour structure and building the new bridge in one stage instead of two. Temporary piers were erected north of the existing piers, and in January 2013 the entire 1,100-foot-long steel truss was shifted laterally onto the temporary piers using hydraulic jacks. Jacking the existing bridge laterally onto temporary piers is an ABC technique. Similar methods have been used, most notably in Utah, to move new bridges into place. 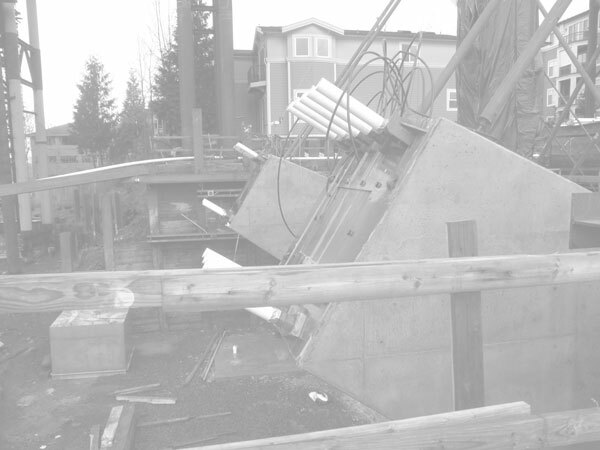 Perched box caissons are a money-saving idea that resulted from early contractor involvement. The single-phase construction of the new bridge means redundant structural features aren’t needed, resulting in a sleeker design. Plus, worker safety is improved by separating workers from traffic. And the approach requires fewer temporary work bridges and makes fewer in-water impacts. That’s not all. In May 2012 the CM/GC price for the 90-percent-complete main span design exceeded the project budget by more than $20 million. But through value engineering refinements, with the CM/GC’s cooperation, more than 75 design refinements were identified that saved about $25 million, Graham said. “Gaining the CM/GC commitment to these savings during the value engineering process was crucial to keeping the project on budget,” he said. 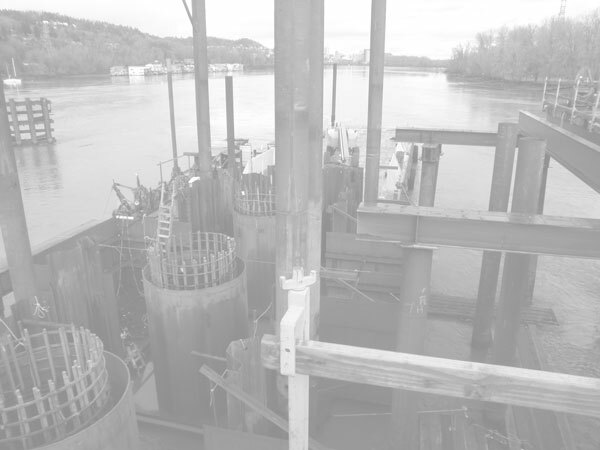 One innovative design refinement is using perched box caissons to construct the pier caps for the replacement bridge’s two river piers rather than building cofferdams in the river. The perched caissons are built on temporary pilings above the drilled shafts and lowered into the river around the shafts. They’re sealed and dewatered to construct the pier cap without driving sheet piles or otherwise disturbing the river bed. “We estimate using perched box caissons gave us a cost savings of more than $6 million and saved six months of time to meet work restrictions related to the Endangered Species Act,” said Graham. The new bridge is scheduled to be finished in November 2015. An Every Day Counts workshop on three-dimensional engineered models for construction helped the Arkansas State Highway and Transportation Department cement its commitment to using 3-D modeling throughout the project delivery process. The workshop was followed by a peer exchange in which experts from the Iowa, Missouri and Oregon Departments of Transportation shared 3-D modeling insights and experiences with the Arkansas agency. More than 60 people attended, including representatives from eight state highway agencies and the Federal Highway Administration. The workshop’s core training materials were customized to encourage audience dialogue and meet the Arkansas agency’s goals. The peer exchange allowed for open-ended discussion with DOTs leading in 3-D modeling implementation. Experts from FHWA, DOTs and the construction industry gave presentations, including an overview of 3-D engineered models for highway construction, applications during design and delivering 3-D engineered models for construction. FHWA and the Arkansas agency planned and organized the workshop, the first of 12 FHWA is sponsoring as part of Every Day Counts. David Unkefer, an engineer with FHWA’s Resource Center, said the division office and the state agency worked with his team to make sure the right people made presentations and attended the workshop. The workshop delivery team developed eight modules from which states can select six for a one-day workshop that best fits their interests and needs. Some modules provide an overview and others delve into specifics. One goal of the Arkansas workshop was to support creation of a roadmap for implementing 3-D engineered models. Arkansas has been using some 3-D modeling for years, but has been converting the models to two-dimensional plans and cross sections manually. 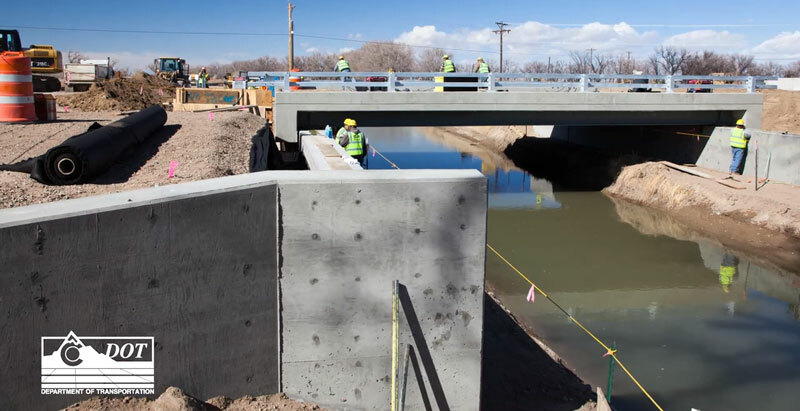 The Colorado Department of Transportation used accelerated bridge construction techniques and the construction manager/general contractor project delivery method when it reconstructed two bridges on State Highway 266 near Rocky Ford. This video shows the process used to slide one bridge and roll the other into place. “We built bridges off-line, then we made those bridges a detour,” explained Dean Sandoval, Colorado DOT project engineer. “Once we made them a detour, we removed the old bridges.” After installing a track system, crews moved the new bridges into place during a short road closure. Using ABC and CM/GC on the project was part of the agency’s effort to try innovation to minimize traffic disruption while repairing structurally deficient bridges. “We’re looking for innovative contracting techniques that aren’t used often, accelerated bridge construction, things that we can do in a short amount of time and make them work,” Sandoval said. Traffic incidents risk the lives of motorists and first responders and cause about 25 percent of all traffic delays. This video focuses on a national program to train first responders to clear incidents safely and quickly and get traffic moving again. 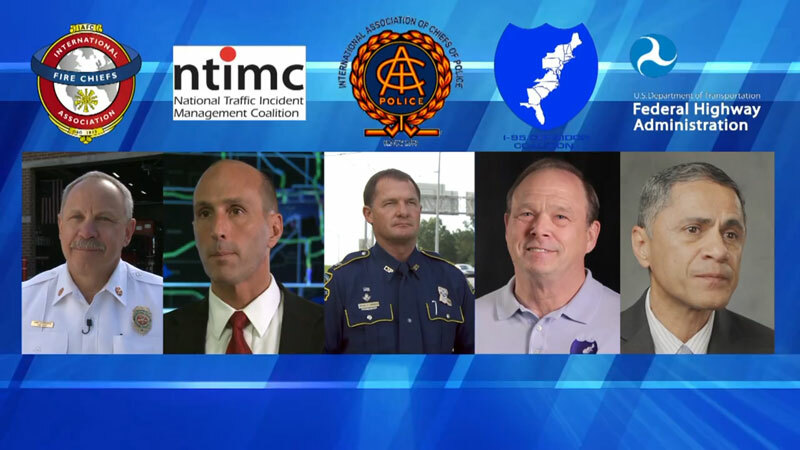 “The national traffic incident management responder training builds teamwork by bringing together emergency responders and helping them understand one another’s cultures, what their priorities are, what their values and areas of emphasis are in responding to a traffic incident scene,” said John Corbin, chair of the National Traffic Incident Management Coalition. “We have to understand what each other’s jobs are and get these accidents cleared as quickly as possible to avoid secondary accidents,” said Hank Clemmensen, president and chair of the International Association of Fire Chiefs. 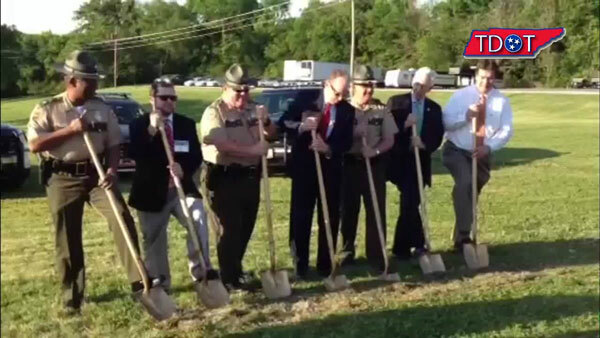 The Tennessee Department of Safety and Homeland Security and the Tennessee Department of Transportation are building the first traffic incident management training facility in the country. The Nashville facility will be used to teach emergency responders best practices for safe, quick clearance of major highway incidents. When finished in fall 2014, it will feature a section of interstate-like roadway ranging from two to six lanes, a two-lane highway section, a two-way interchange and a four-way intersection. The Ohio Department of Transportation, National Park Service, Ohio Department of Natural Resources and FHWA executed a programmatic agreement for Federal-Aid highway projects impacting Section 6(f) resources under the Land and Water Conservation Act. The first of its kind nationally, the agreement establishes review time frames, delegates authority to the two state agencies when permissible and streamlines environmental review processes between the two federal agencies. That will save time and money for all four agencies as projects move through the Section 6(f) process. The Gila River Indian Community Department of Transportation has awarded its first construction manager/general contractor contract. Located near Phoenix, Arizona, the project will replace the Gila River Bridge on Route 7. The Gila River Indian Community received a Strategic Highway Research Program 2 award to use accelerated bridge construction on the project. The contractor, designer and Gila River Indian Community staff will convert the traditional bridge design to ABC to cut on-site construction and road closure time and improve bridge quality. The original design called for a 6-mile detour for six months, but using ABC methods will allow crews to replace the bridge in weeks. The Colorado Department of Transportation and the city of Grand Junction partnered on a project to build the state’s first diverging diamond interchange. They celebrated the opening of the interchange on I-70 at U.S. 6 and 50 with an April ribbon cutting. The project cost $4 million, compared to $10 million to $15 million for interchange reconstruction alternatives. This type of intersection requires minimal right-of-way acquisition.